FARMINGTON, ME (April 11, 2019)—The University of Maine at Farmington will present a theatre workshop production in staged readings of two new, original plays by award-winning playwright and director Jayne Decker, Friday, April 26, 2019, at 7 p.m., in the UMF Alumni Theater. The performance is free and open to the public. Post-play reception with playwright and actors following performance. 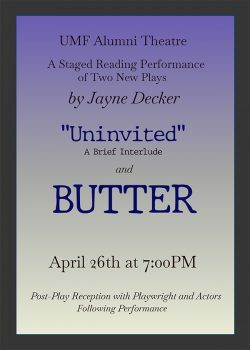 The production features “Uninvited” – a one act play about a hungry man who enters a house to escape the rain and confronts the woman who comes home, and “Butter” – a play set in a small rural town in the 1970s, a time before parents had cell phones and kids still walked to the corner store alone. Of the production’s 10 person cast, Decker is bringing together a number of UMF graduates and former Theatre UMF actors and crew from across the country from as far away as Chicago. UMF alumni actors for the upcoming plays include Mandi Favreau, class of 2001, and Austin Hayes class of 2015. They are two UMF graduates who went on to hold theater director positions at Messalonski High School and who, over the years, have helped their students connect to the theatre arts program at UMF. Other alumni returning to perform include Jesse Manson class of 2003 (Chicago), Zack Peercy class of 2017 (Chicago), Nathan Sylvester class of 2015 (Portland). Current students involved in the performance include, Hailey Craig (Trenton) and Steffon Gales (Roxbury, Mass.) and the voice of 10-year-old Adelaide Minton. Nicole R. Clark, class of 2015, returning to the stage manager’s booth, is also an alum who will be working with current stage manager – Hope Lash (Waldoboro.) Dan “Tree” Robbins is also returning to the UMF stage for this performance. Tree is well known for his roles in Decker’s plays over the years, and he has also been involved as a dialect coach for UMF Theatre productions. The event also coincides with a fundraising campaign to improve areas in the existing theatre space to enhance the learning environment for UMF students and help bring the appearance of Alumni Theatre in line with the quality of the performances staged in this historic venue. She has also presented workshop productions of her original plays “Good Medicine;” “Stars Falling,” winner of the 2002 Maine Playwriting Award; “Jelly Moonshine;” and “Songbird,” a touring play about the Iraq War. “Cracked Shells,” an original play by Decker about domestic violence, was commissioned by Franklin County Network’s Peace in Our Families and was featured again at the 2009 Maine Women’s Studies Conference. This Theatre UMF production is sponsored by the UMF Division of the Arts.